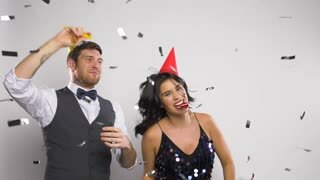 Search Results for "party blower"
Best time together. Happy young family sitting on the bed and blowing party horn blowers while all of them wearing party hats in Slow motion. 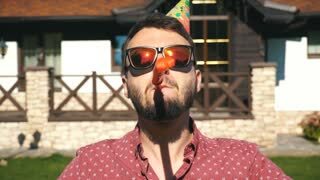 young man with chocolate cake and a candles playing with party blowers and takes selfie. Little girl sits on floor at room with big sofa holding party-blower in her hand and gift boxes. 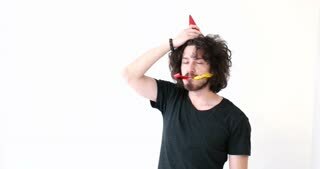 Close up of young man with cake and a candles playing with party blowers. Cheerful mother and son sit on the couch near the decorated Christmas tree and blow into the unfolding tube. Celebrating new year, Christmas or birthday. Birthday pipes. Party horn blower. 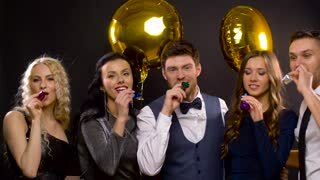 Group of friends enjoy with party horn blower in slow motion in front of shiny shimmer curtain background. 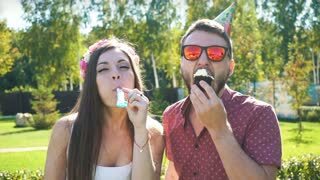 Funny playful couple having fun with party horn blower and balloon. 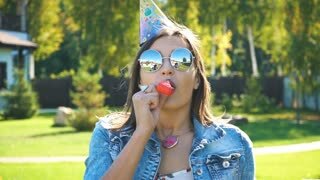 Two girls having fun with party horn blower in slow motion in front of shiny shimmer curtain background.